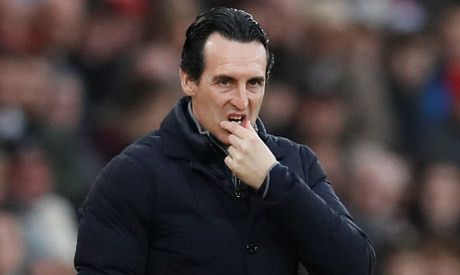 Arsenal manager Unai Emery believes Mauricio Pochettino is "very happy" at Tottenham Hotspur and has questioned the notion of the Argentine leaving north London to take over at Manchester United next season. Following Jose Mourinho's sacking as United boss after the side's poor start to the season on Tuesday, Pochettino has emerged as the bookmakers' favourite to become the next full-time manager at Old Trafford. Pochettino has been viewed as a long-term target for the club because of his attacking style and development of youth, traits synonymous with the successful United sides under Alex Ferguson but largely absent since the Scot retired in 2013. "I think he's (Pochettino) very happy at Tottenham," Spaniard Emery told reporters ahead of Arsenal's League Cup quarter-final clash against third-placed Spurs on Wednesday. "I think he's coaching a very big team with very big players and now they are in the Champions League, they are also in a better position in the Premier League than Manchester United. "I don't know if he's thinking to change for another club, but I am looking at him with a very big commitment to Tottenham and he's creating a good performance a good idea at Tottenham." Pochettino himself has dismissed the links to the United job as "rumours", saying he was committed to delivering results in his current job. The 46-year-old has guided Spurs to three consecutive top-three finishes in the Premier League, but is yet to win a major trophy. Despite failing to make a single close season signing, Spurs are third in the league after 18 games, hot on the heels of leaders Liverpool and defending champions Manchester City. Manchester United are sixth, 19 points adrift.